This is the first time I have ever tried using methi leaves/ fenugreek leaves in a rice dish. I love the aroma and flavour it lends. Its also my first time using cucumber in a rice dish! NO! Im not a weirdo! It tastes really good. Love it crunchiness :) Broccoli and cucumber? ?unusual combo?....I think not! Tastes awesome with pappadums and channa masala. An easy lunchbox meal.......no complaints!.......and a happy tummy! In a wok, heat oil and add the cumin seeds. Add and saute the garlic. Add the onions and saute till transparent and slightly browned. Add the chopped red chilli. Add the broccoli and saute for a few minutes. Add some salt, cumin powder and pepper powder. Saute for a few minutes. Add the methi leaves and cucumber and stir. Add the cooked rice little by little and mix well on low flame. Add the soya sauce and coriander leaves and mix well. Dont mix too much of rice. stop adding rice when you think the masala wont be enough to mix anymore. I like my rice with more masala and less rice. 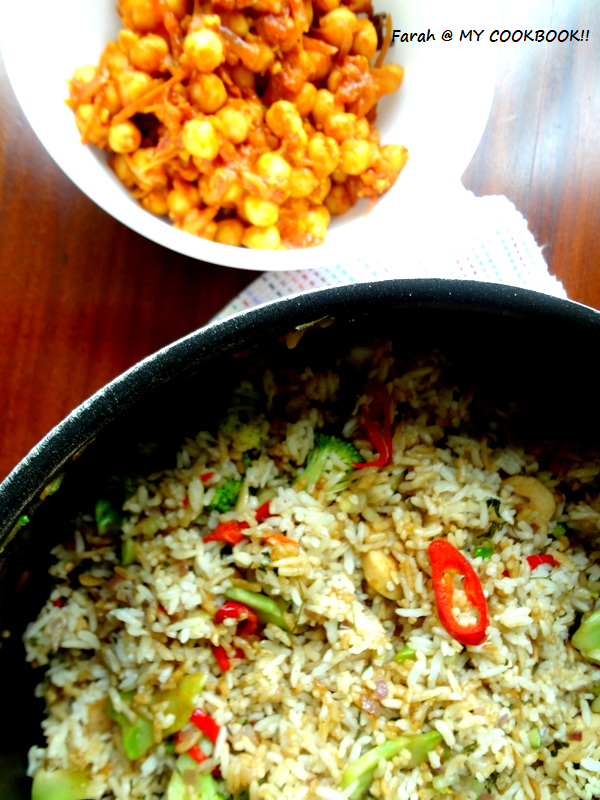 sending this recipe to favourite rice recipes event hosted by amritha. thanks amritha.........and yes!its extremely healthy! Thanks Farah..would love to try it sometime very soon!! 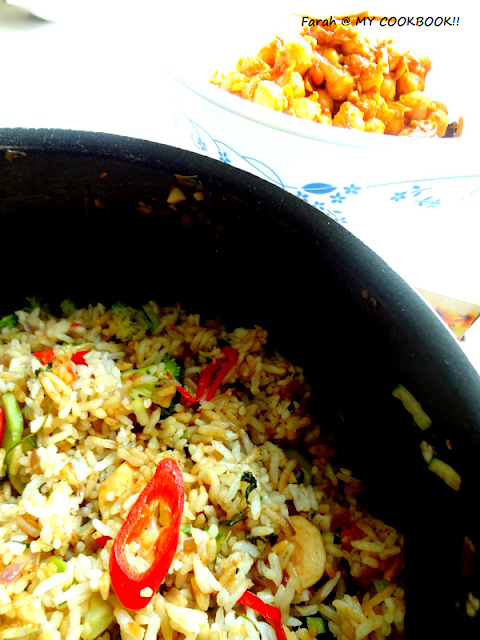 Very interesting combo, healthy one pot meal. 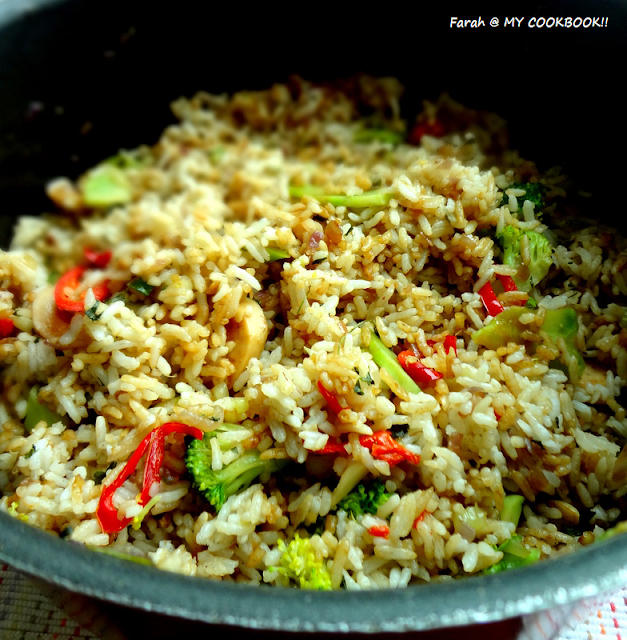 delicious and healthy rice..loved the flavours!